After a two-year long hiatus, mainland Chinese boy band HIT-5 finally made their music comeback this month with the release of their brand new full-length album, How Are You Doing <你们还好吗>! HIT-5, managed by Beijing’s Idol Factor Entertainment and TH Entertainment, went through two years of gruesome training before releasing their debut single album, HIT, in October 2008. 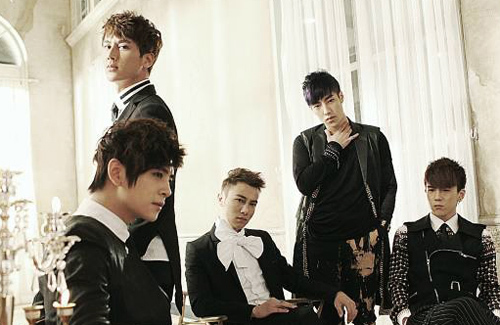 They were the first mainland Chinese boy band to top music charts in Taiwan. The boy band, with an average age of 24, comprised of five members at its peak, which included leader “G-King” Guo Ziyu (郭子渝), lead vocalist “David” Duan Huangwei (段黄巍), lead dancer “Kido” Gao Yu (高宇), “Dear” Dong Yufung (董玉峰), and youngest member “Evan” Yang Fan (杨帆) . In late May, HIT-5 teased fans with the release of their comeback single “Shine on Me”, a electropop dance song produced by American record producer, Fingazz. With an even blend of hip hop, electropop, and disco as the album’s main melodies, TH Entertainment invited South Korean musician Kim Won Hyun to oversee the album’s production. Consisting of twelve tracks, How Are You Doing was officially released in mainland China on July 5, 2013. Although leader Guo Ziyu participated in the album’s recording, he prematurely announced his planned departure from the group when HIT-5 held their comeback showcase concert in Beijing on July 4. On July 8, the HIT-5 members released an official statement about Guo Ziyu’s departure, stating that the leader will leave the group after promotions for How Are You Doing are completed. Chinese boy bands and girl bands can greatly China’s image abroad, just as Korean band did before them. No amount of state-driven (by the government)’soft power’ can do the trick, but the private sector and pop culture can. Chinese films, at the moment, cannot, as they are too ‘Chinese’, but pop is universal. Shine On Me sounds really familiar, I just can’t put my finger on what.